Welcome to Friday and TGIF Challenge 34!! It is the last day of school today before the Christmas break. I wanted to take a small gift for the teachers and staff to school to wish them all a Merry Christmas. Here is the challenge sketch for this week. I know you love to create Christmas projects and this is the last Christmas challenge sketch of the year! Next week TGIF will be taking a week off to celebrate the holidays. So get stamping! What are you waiting for?! See what the rest of the design team has created and read all of the challenge details on the TGIF Challenges site! We would love you to play along. 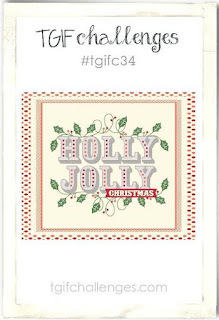 Thank-you for following the TGIF Design Team this year. There are some amazing challenges coming in 2016 - get ready!